LAI, ERIC 2018. The Formal Ramifications of Bruckner's Bipartite Sonata Form. Music Analysis, Vol. 37, Issue. 3, p. 339. HORTON, JULIAN 2018. Form and Orbital Tonality in the Finale of Bruckner's Seventh Symphony. Music Analysis, Vol. 37, Issue. 3, p. 271. Korstvedt, Benjamin 2018. 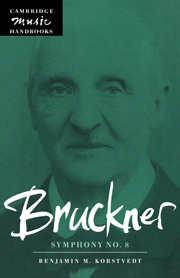 Language and Ideology in the German Reception of Bruckner's Symphonies in the 1930s. The German Quarterly, Vol. 91, Issue. 4, p. 460. Ramirez, Miguel 2013. Chromatic-Third Relations in the Music of Bruckner: a Neo-Riemannian Perspective. Music Analysis, Vol. 32, Issue. 2, p. 155. Hansen, Mathias 2010. Bruckner Handbuch. p. 197. Röder, Thomas 2010. Bruckner Handbuch. p. 73.